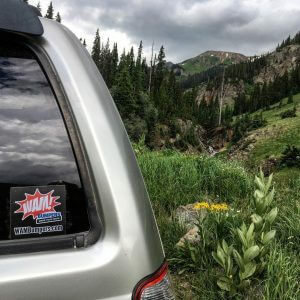 Using my Wincher Bumper by Wam Bumpers with my newly installed Smittybilt XRC 9500 on “The Wall” on Poughkeepsie Gulch in Ouray, Co.
One thing is for certain, when you buy a Wincher bumper from WAM Bumpers it’s usually purchased with the idea of installing a winch. 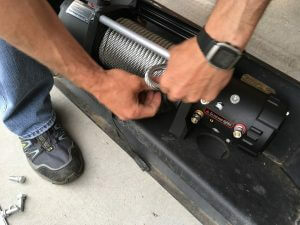 How hard is it to install a winch though, and what will you need to do it? Well, let’s take a look. 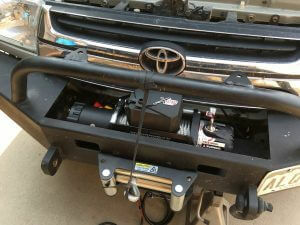 Today we are installing a Smittybilt XRC9500 winch with steel cable on a 2001 Toyota 4Runner SR5. 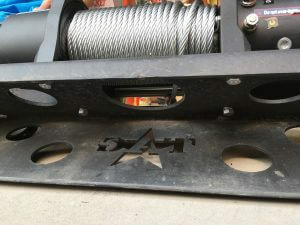 It’s a good idea to install your winch in the bumper before you install the bumper assembly on your 4×4 the first time. This way you only have to take your bumper off once, and only annoy your buddies once when you ask for help. For winch options, speak with Wam Bumpers about what winch they have available for your vehicle application. Please also remember that to do this install yourself, you will probably need help and heavy lifting is required. So, please be careful. That said, let’s get started. 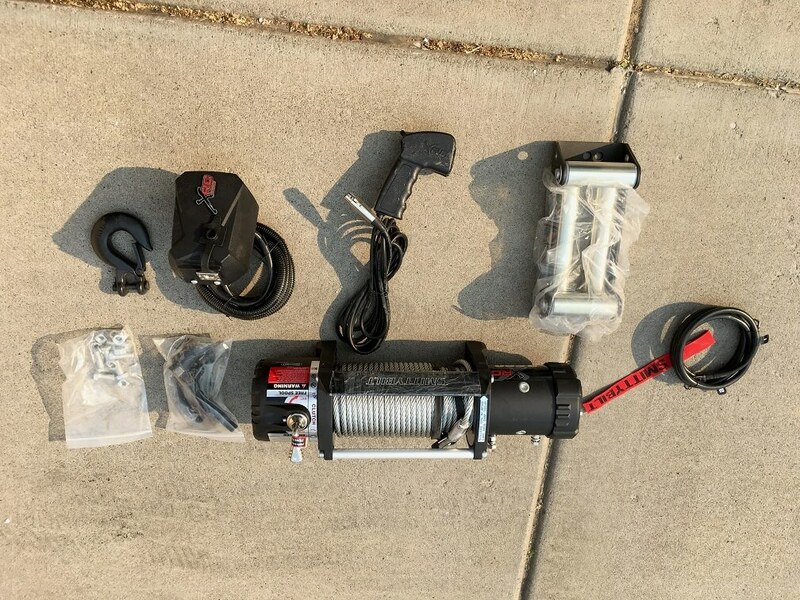 Before starting your installation; make sure you have received all the winch and bumper components needed. 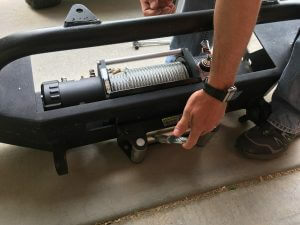 When you start to install the winch in your bumper, you’ll want to make sure that you have the wrenches, ratchets, drill/screwdrivers, all bumper brackets/hardware, and all your winch assembly parts ready in a convenient spot before you start the install. Also, to make sure that you can get the winch inside the bumper, you’ll want to have the bumper removed as well. It’s usually a good idea to place the winch on the winch mount plate inside the bumper to make sure all of the holes line up, and make sure the winch is not hitting any parts of the bumper itself. You may need to use a ratchet and wrench to get to both sides of the fairlead bolts to tighten them well. 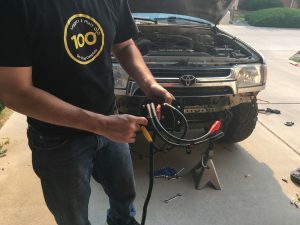 Once you have made sure that the winch lines up with the holes, and that it doesn’t interfere with the bumper, next install the fairlead that you have for your winch line by bolting it into place so that it lines up with the rectangular winch line hole in the front of your bumper. Now place the square nuts that come in the winch hardware pack into the square slots on the bottom of the winch. Be care as these square nuts typically fall out easily once inserted. Placing the winch on the winch mount plate and getting the bolt holes to line up may take a bit of shifting around. Just be patient and remember that the winch and bumper are both heavy. So, be careful how you use your back and legs. Next place the winch on the winch plate inside your Wincher bumper. With the winch line hook removed, pass the winch line through the fairlead and reattach the winch line hook. If you’re wondering why my bumper says TAG instead of Wam, that’s because Wam Bumpers bought all of TAG’s designs. However, they are not the same company. With care, finger-tighten the four bolts that thread into the square nuts to affix the base of your winch to the winch plate on your Wincher bumper. Since the square nuts move easily, make sure to start the bolts by finger tightening them so as not to cross-thread the square nuts. Using the wire diagram that was provided with your winch, connect all corresponding cables with their corresponding terminals. Most modern bumpers have a label on the winch drum beside the corresponding terminal and another label on the corresponding end of the cable that should be connected. On many modern winches, labels marked with letters are used on the winch motor terminals and cables that correspond. 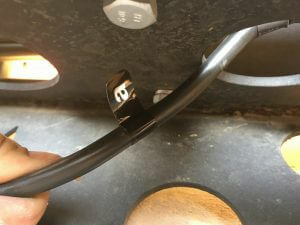 They typically also use + and – labels attached to the ends of the cables that connect to the battery terminals. Make sure and test the position of the cables before tightening the terminals on the winch motor. Making sure that the cables sit in a way that don’t pinch or bind the terminals when the winch is tightened to the winch mount plate. Tighten up the bolts that attach the winch to the winch plate, and the nuts on each of the winch motor cable terminals. Now take the cables that you connected to the winch motor, and connect the corresponding ends to the winch controller box. 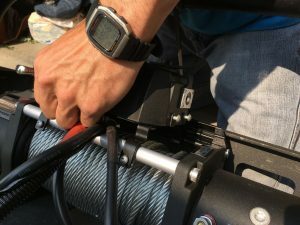 Most winches come with a bag of various brackets so you can configure the mounting location of your winch controller box in a variety of ways. Take some time and figure out what location will work best for your application. 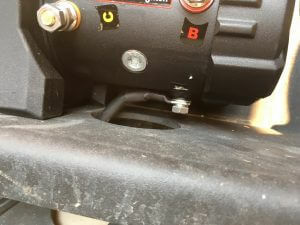 Using the brackets and hardware that are provided with your winch (or after fabricating custom brackets if desired/needed) attach the winch controller box to the winch spanners, bumper, or wherever you think it’s most likely to be easily accessible. Making sure that all the cables are in a safe place and routed through the Wincher bumper winch mount plate correctly, place the bumper in position your 4×4. At this point, you will want to adjust the bumper, and install all the bumper hardware. 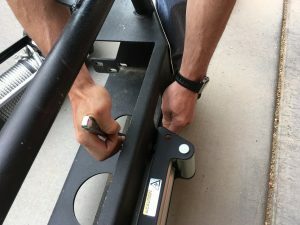 Moderately tightening all the bumper installation bolts enough so that they hold the bumper in place, but also allow for the bumper to be moved for adjustment by hand. 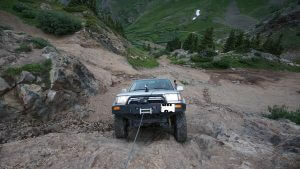 With your bumper and winch loosely attached to the frame, route the power, negative, and ground cables in a way that they can be connected to the appropriate battery terminal, while making sure that all excess cable is out of way of any harm during day-to-day driving or off-roading. Many times zip ties come in handy for these types of applications and processes. We found that the winch controller box was contacting the grill. To fix this we decided to use the provided brackets to orient the winch controller box vertically. Then we adjusted the bumper to fender spacing. Now adjust the bumper so that there is an even spacing between the fenders, grill and the top of the bumper in all areas. Also pull the bumper out, or push it in so that the “lock/free spool” feed lever can fully rotate and engage/disengage accordingly. 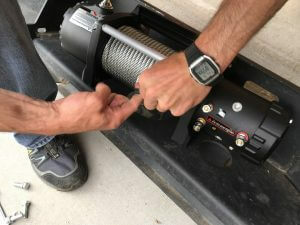 Test the remote/winch to make sure that the winch works correctly. If the winch motor isn’t working, go back and check your wiring diagram and how the wires are actually run. If the winch is functioning correctly, recheck all the terminal nuts, winch mount bolts, and fairlead bolts making sure they are all tightened appropriately. 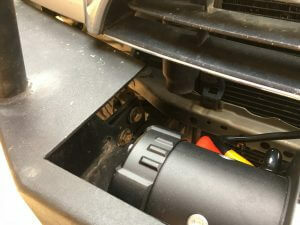 With all the bolts/terminals checked on the winch and battery, recheck the spacing of the bumper and winch feed lever. If all the spacing is good, tighten all the bolts for the bumper brackets making sure that the bumper is tightened enough so as not to move under impact or winch use. Take your 4×4 out and have fun! Don’t for get to take photos and share them with us here at Wam Bumpers. See, that’s not so hard, now is it…? 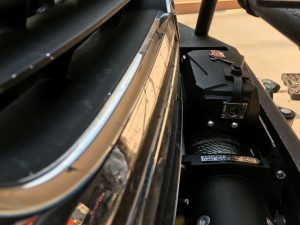 If you’re are interested in purchasing a winch, or a Wam Bumpers Wincher Bumper, and need some help on how to justify the purchase, check out our “Conventional Winch Uses (aka “justifying the buy”)” article on the Wam Bumpers Blog here. *Not all Wincher Bumpers from WAM Bumpers are designed identically. 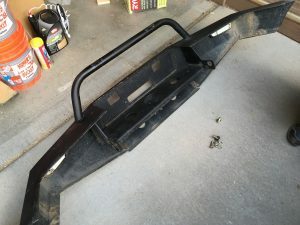 So, while the WAM Bumpers Wincher bumper that we are using for this instillation overview is from WAM Bumpers, Wincher Bumpers for other vehicle models (not a 3rd gen 4runner) may vary slightly.